Loretta Krupinski is the award winning author/illustrator of 25 books for children, published by Little, Brown; Harper Collins; Hyperion; and Dutton, among others. Several of her books have been chosen for Pick of the List by the American Library Association. Her illustrations have been widely exhibited, including at Boston Symphony Hall, the New England Children's Books Exhibition, Mystic Maritime Gallery, and The Society of Illustrators "Original Art" exhibition in New York City. Loretta is also an award-winning marine artist. She lives in South Thomaston, Maine. It's fall! The leaves are changing color. 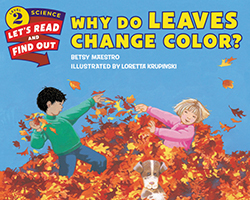 This Let's-Read-and-Find-Out picture book explains the magical process of how leaves change their color in autumn. Now rebranded with a new cover look, this classic picture book features graceful text and simple, fun diagrams to explain concepts like photosynthesis and the different types of leaves. This book also includes simple activities to do with leaves like leaf rubbings. Both the text and art were expert-vetted for accuracy.